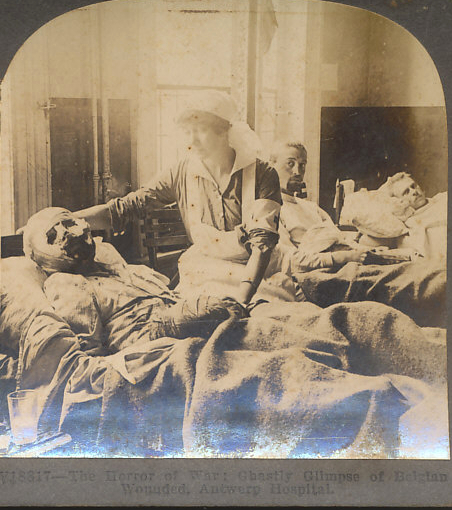 Stereo card view of wounded Belgian soldiers in an Antwerp hospital attended by a Red Cross nurse. The nurse attends to a severely wounded soldier whose head, face, and hands are swathed in bandages. V18817—The Horror of War: Ghastly Glimpse of Belgian Wounded, Antwerp Hospital. "Casualties" includes dead, wounded, missing, and taken prisoner. Some of the wounded could be healed and return to war. The nature of many of the wounds, bodies torn by shrapnel, soldiers blinded by gas, meant many would not return. Improvements in medicine and medical practices saved the lives of many who would have died with similar wounds in earlier wars. The violence of the explosives in the war meant that some of the victims of artillery shells left nothing identifiable. Missing included deserters or others who, in the chaos of war, left.